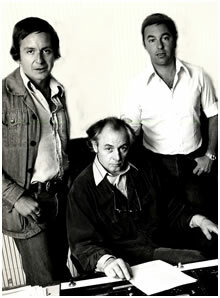 The first contact between R. D. Laing and the composers Ken Howard and Alan Blaikley came about in 1976 when Howard invited him to contribute to a film interview for his documentary series Life Force (see Scrapbook). At this time Blaikley was training as a psychotherapist at the Westminster Pastoral Foundation, where Laing’s celebrated ‘existential study in sanity and madness’, The Divided Self, with its thesis that madness can be a positive transformative experience, was a required – and inspiring – text. Howard and Blaikley decided to approach Laing again with a view to some form of collaboration – a sort of marriage between music and psychotherapy. Known for their hit songs in the 1960s and 1970s, they had also displayed a keen interest in broadening the scope of pop music, exploring interior and philosophical themes in albums such as Ark 2 (Flaming Youth), Private Parts (Peter Straker) and the eponymous Matthews Southern Comfort. This and many other ideas were discussed at long afternoon sessions, invariably fuelled by copious draughts of malt whisky and punctuated by Laing’s accomplished piano improvisations and interruptions by his naked infants. When the epic spermatozoa extravaganza finally failed to lift off, Laing somewhat tentatively produced a sheaf of battered and much amended poems which he began to declaim in his powerful Glaswegian rasp. These profound, witty and often beautiful expressions of his inner feelings at a time when much of his outer life was in turmoil immediately inspired Howard and Blaikley to devise a wonderfully sympathetic and varied musical counterpart. Tony Stratton-Smith, the maverick head of Charisma Records, who had launched the careers of artists ranging from the Bonzo Dog Band to Genesis, the Nice and Lindisfarne, was intrigued by the concept and sessions were set up at the Regents Park Recording Company near Lord’s Cricket Ground. Stephen Lipson who has worked with Paul McCartney, The Rolling Stones, Cher and the Pet Shop Boys, engineered and Nic Rowley was Musical Director. The album was produced by the composers. After Laing’s death on 23 August 1989, excerpts from Life before Death were played at his memorial service at St James’s, Piccadilly.